The Merced River flows throught the central part of California in the heart of California’s Mother Lode. It is a 145 mile tributary of the San Joaquin River which flows from Sierra Nevada into the San Joaquin Valley. Merced River makes a headlong rush through glacially-carved canyons, rugged mountains and foothills. It is famous for its swift and steep course and Yosemite Valley, where it eventually changes to a slow moving waterway once it reaches the lowlands. Gabriel Moraga named the river ‘El Rio de Nuestra Señora de la Merced’ (River of our Lady of Mercy). He was a Spanish explorer who gave it the name because the it was the source of irrigation to the fields at the lowlands of the area. Thus all the agriculture and prosperity was brought by the river. Areas surrounding the path of this beautiful river were once famous for gold rush. With the discovery of first gold nugget in early 1848 by, James Wilson Marshall, who was working at Sutter’s Mill to build a water-powered sawmill, the spark of Gold Rush was unleashed and following it many events took place which laid the shape of American history. Some of the famous creeks that flow into the Merced River include; Red Peak Fork, Illouette Creek, Bridalveil Creek, South fork Merced River –Triple Peak Fork, Lyell Fork, Sunrise Creek, Tenaya Creek, Yosemite Creek, Cascade Creek, North Fork Merced River and Dry creek. There are many other smaller creeks and dry gulches that feed into the Merced River that are all gold- bearing. The famous gold rush to California brought forth lot of new changes in the area along the Merced River. Many boom towns were established during that time that were at first only inhabited by Native Americans, but soon thousands of miners from around the world descended upon the area. The river gravels were rich, and considerable gold was recovered by small-scale mining methods, while later years brought on further investment and larger mining operations. 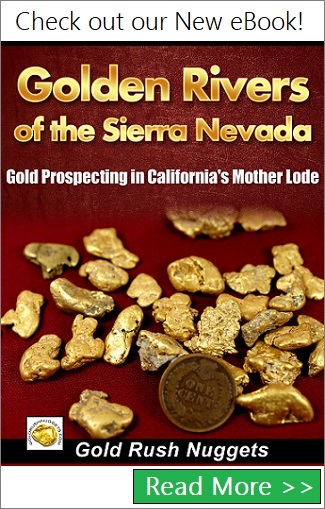 Some huge gold nuggets have been found in the Sierra Nevada Mountains, and the Merced River drainage was no exception. Areas around El Portal, Livingston, and the Clearinghouse District were some of the largest establishments along the Merced River. People still come to these areas to try their luck to look for gold, but the craze and massive rush time is gone long. Most of the better gold ground is under mining claim on the Merced River itself, but some research can still help you find some nearby areas that are still open to gold prospecting.